The latest video slot based on the ultimate argument inducing board game is Monopoly Millionaire. Created by Bally Technologies, it’s a 5 reel, 40 payline video slot that’s packed full of features. They include randomly hitting multipliers of up to 10x, transforming symbols and lots of bonus rounds that include free spins and pick me prizes. Play on your PC, tablet or mobile from between 40p and £100 per spin. The visuals in Monopoly Millionaire are as shiny as you’d expect from a high-profile branded video slot. The reels are set against a skyscraper-filled skyline and each position on the 5×5 grid spins independently. On the reels are plane, boat, car and motorbike tokens as well as bank notes and a couple of symbols featuring Mr Monopoly himself. The most lucrative symbol is the diamond. Land 5 of these in combination and you’ll trouser and award of 2.5 times your bet. That same payout is on offer from the wild that replaces everything bar the scatter. 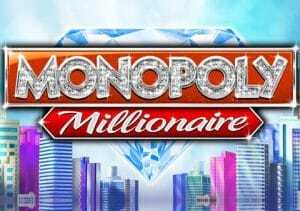 Like the other games in this series, there’s plenty of variety on offer in the gameplay in Monopoly Millionaire. Chance and Mystery features – the Chance and Mystery symbols that land morph into the same matching symbols. A new payout calculation follows with the newly transformed positions in play. Community Chest Bonus feature – you could be awarded a Community Chest pick on any spin. Choose a card to reveal a multiplier of 2x, 3x, 5x or 10x which is applied to any wins from that spin. Railroad Bonus feature – 8 free spins are on offer here. A train rumbles along a track above the reels containing multipliers of between 2x and 10x. This multiplier is applied to any win from that free spin. Free Parking Bonus feature – pick 5 of the 23 cars in the car park. These will reveal cash values of between 1 and 7 times your stake or jackpot symbols. Finding 1, 2, 3, 4 or 5 jackpots pays 10, 20, 40, 100 or 400 times your total bet. Electric Company Bonus feature – this second free spins round awards 10 bonus games. Keep a special eye out for the switch symbol that can land on reel 25. This illuminates all the lamp symbols which can each award a cash prize of up to 25 times your bet. More free spins are on offer if the +2 symbol lands. A spin of the Bonus Wheel could also send you to jail. You’ll then play the Go to Jail Bonus feature where the goal is to roll the dice and try and land a double. If you manage it on your first try, a payout of 75 times your bet is awarded. If you’re successful on the second or third attempt the prize is 30 or 15 times your bet. If you totally whiff you’ll get a 5 times bet consolation prize. Monopoly Millionaire also offers a shot at landing a jackpot prize. This can strike at random on any spin via the Super Jackpots feature with the jackpot being £1 million! We’ve sometimes found the Monopoly video slots to be too overloaded with complicated extras. Bally has got the balance pretty much spot on here. There’s a good variety of extras but the game isn’t too overloaded. If you fancy taking a virtual trip around the famous board, then Monopoly Millionaire is a pretty good place to start. Bally also has other branded titles with Titanic and Michael Jackson King of Pop recommended.